The panda bear is native to South-Central China and its diet consists of over 99% bamboo. It is also the star of our panda games! From strategy to puzzles to side-scrolling platformers, we have the panda-themed game for you! What’s cuter than a panda? Three pandas, of course! And we’ve got 3 Pandas in Fantasy, where three pandas are ready to live a fantasy adventure, but they need your help! Solve puzzles in the levels to unlock mysteries and try to help the pandas escape in one piece from this fantastic world. Looking for something a little more down to earth? Follow our three friends to Japan in 3 Pandas in Japan. The bamboo-loving trio just had their vacation ruined by some thieves. Can you help them get home safely? And if you’re still looking for more triple-threat action, try 3 Pandas 2: Night. How could three cute little pandas get into so much trouble? Play the game and find out! How about a game that’s out of this world? The robot pandas are coming, so join the Panda Wars and save the real, fluffy ones. 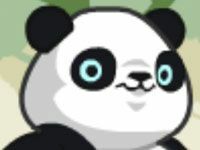 Or travel through time in Pandas Big Adventure and help the panda out of the time machine mayhem. We even have dancing pandas! Bust out some dance moves in Panda Dancing and find out just how cute things can get. Or, try to get some air in Panda Jump. Pandas on trampolines; need we say more? Join the Pandamonium of fun! Can things get any cuter?